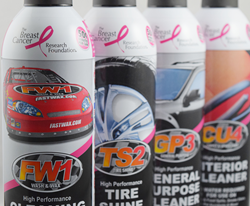 Three years ago, Smart Circle International, LLC and RGS Labs International, Inc. partnered with the Breast Cancer Research Foundation to create the FW1 Pink Promotion. To date, the program has raised $5,500,000 to fund critical research that is improving the quality of life of breast cancer patients and developing life-saving treatments. To date, the program has raised $5.5 million to fund critical research that is improving the quality of life of breast cancer patients while developing new life-saving treatments. Three years ago, Smart Circle International, LLC (“Smart Circle”) and RGS Labs International, Inc. partnered with the Breast Cancer Research Foundation (“BCRF”), the world’s largest private funder of breast cancer research, to create the FW1 Pink Promotion. Leveraging their network of independent corporate distributors to drive regular, reliable contributions to BCRF, Smart Circle commits an upfront donation of $0.50 for every can distributed, rather than sold, to ensure donation goals are met regardless of actual sales. To date, the program has raised $5.5 million to fund critical research that is improving the quality of life of breast cancer patients while developing new life-saving treatments. Because every two minutes a woman hears the words, “you have breast cancer,” the FW1 Pink Promotion runs year-round, keeping focus on the issue well beyond Breast Cancer Awareness Month in October. Entering the fourth year of the campaign, Smart Circle continues to support BCRF through specially marked cans sold at on-site demonstration events throughout the United States. With over 200 such events held daily at retail and convenience stores, the campaign’s overwhelming success is based on the power of numbers. Through the year-round campaign, Smart Circle can both maximize the money raised for research and encourage constant education among its clients and customers. As a direct result of the $5.5 million raised by the FW1 Pink Promotion, 22 distinct research grants and over 1 million lab hours have been funded. This year, Smart Circle is funding the research of seven leading investigators at top tier medical and academic institutions, including Vanderbilt University School of Medicine (Nashville, TN), New York University, Langone Medical Center (New York, NY), Mayo Clinic Cancer Center (Rochester, MN), University of Pittsburgh Cancer Institute (Pittsburgh, PA), the University of Texas MD Anderson Cancer Center (Houston, TX), University of Michigan (Ann Arbor, MI), and Yale University School of Medicine (New Haven, CT). Smart Circle plans to continue supporting BCRF in the fight to eradicate breast cancer and is honored to support such an outstanding organization for a vital cause. Smart Circle is one of the world’s leading face-to-face marketing companies, specializing in implementing and executing in-person sales and marketing solutions through its dynamic national independent sales network, creating entrepreneurial opportunities for businesses to thrive and reach their goals. Learn more about Smart Circle and the FW1 Pink Promotion. The Breast Cancer Research Foundation (BCRF) is committed to being the end of breast cancer by advancing the world's most promising research. Founded by Evelyn H. Lauder in 1993, BCRF-funded investigators have been deeply involved in every major breakthrough in breast cancer prevention, diagnosis, treatment and survivorship. This year, BCRF is investing $54 million to support the work of 240 scientists at leading medical and academic institutions across 13 countries, making BCRF the largest private funder of breast cancer research worldwide. By committing 91 cents of every dollar directly to its mission, BCRF remains one of the nation's most fiscally responsible nonprofits. BCRF is the only breast cancer organization in the US with an "A+" from CharityWatch and has been awarded Charity Navigator’s highest rating of four stars 13 times since 2002. Learn more about the Breast Cancer Research Foundation.